You’re planning your big day, so exciting! And a little overwhelming. We know the task can be daunting, but having the right caterer can take some of the worry off your plate (pun intended). So, how are you supposed to know what caterer to pick, what questions should you ask to find out if they are “the one”? Of course, there are the obvious questions like, “are you available on my date?” and “how many weddings have you catered?” But, these five not-so-obvious questions to ask a caterer will help you narrow down your search. One: Have you worked my venue before? The wedding industry is big! After all there are photographers, videographers, florists, coordinators, and the list goes on. But, we’d have to say that it is most difficult to be a caterer when it comes to working at new venues. If a caterer hasn’t worked your venue or if you are planning a backyard wedding, it is important to choose a caterer that has experience in all types of settings. 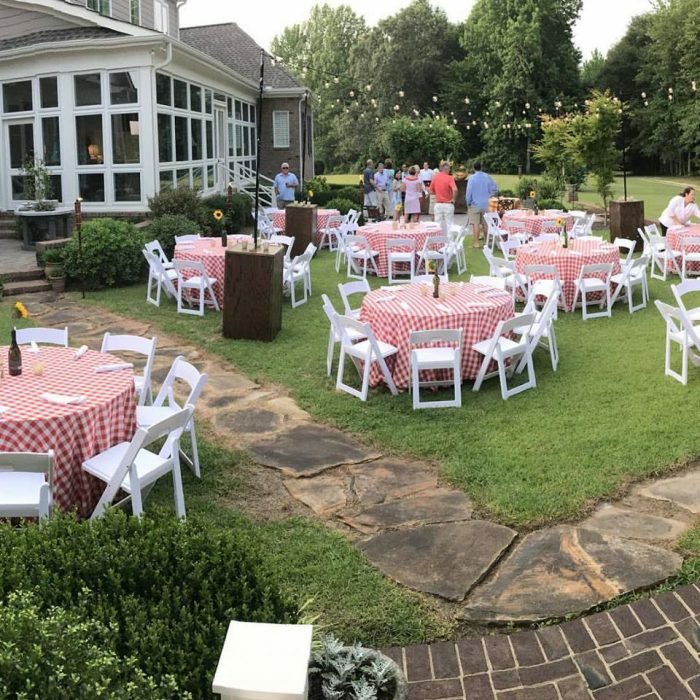 At Scarborough Fare Catering, we love working at new venues (although we are partial to the beautiful Martinsborough in Greenville, NC). 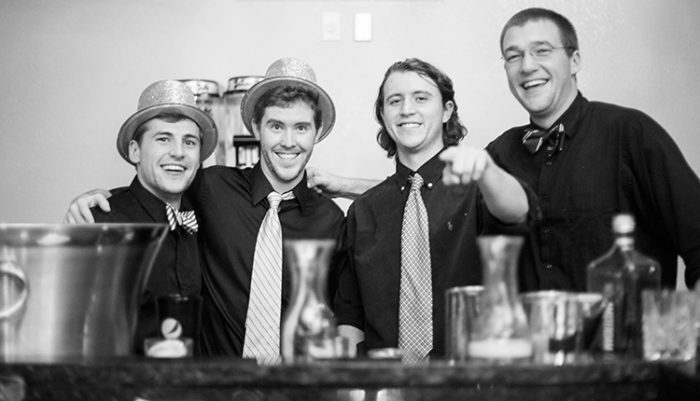 If we have never worked your venue, no worries! We will do a walk-through before the big day to make a plan for overall culinary and service success. We believe in on-site final cooking to ensure the highest quality taste and presentation. Gorgeous backyard wedding catered by Scarborough Fare. Two: Will you provide table settings (and even the tables themselves)? This is a very important questions for couples who choose a venue that is not equipped with dining set up. It will save you time and hassle if this is something your caterer will take care of. 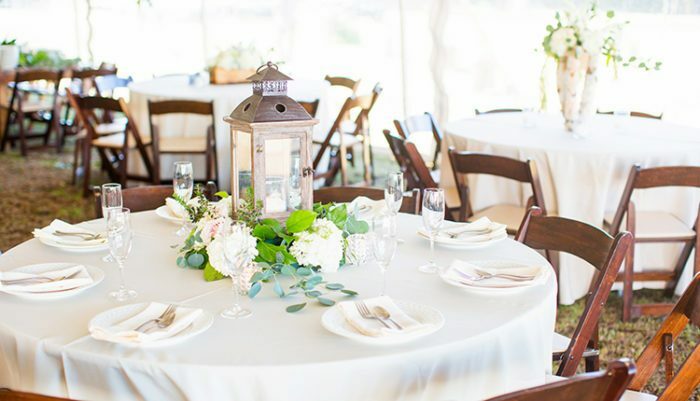 Scarborough Fare offers rentals for a wide range of event necessities, including everything from tables, tents and lighting to beautiful formal china, centerpieces, linens and more! And, we do it all from set up to clean up! 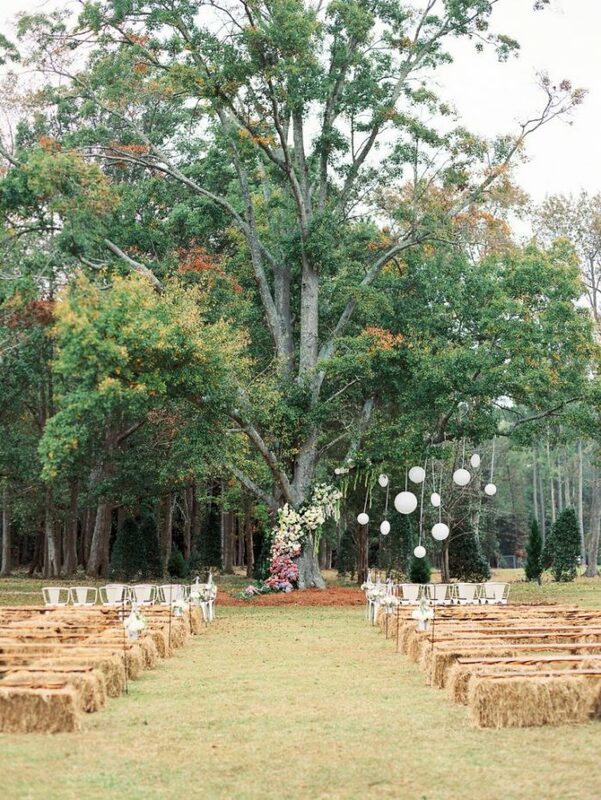 We provided the wood for the seating at this beautiful outdoor wedding in Grimesland, NC. Tables, chairs, linens, lighting and bar all provided by Scarborough Fare Catering. Three: Where does the food come from? You’ll want to be sure that your guests enjoy high-quality food. For this, you will have to look beyond your caterer, to their supply chain. Do they use local products and fresh, seasonal produce? At Scarborough Fare, we have embraced our southern heritage! We use local ingredients to create an extensive menu of delicious dishes. Four: Are you flexible on your menu or can I only pick from what you have? For some couples a family recipe or food item means a lot and needs to be incorporated into the event. Truly great caterers will work with you to create the perfect menu. If something is important to you, it’s important to us. At Scarborough Fare Catering, our menu is continuously developing. We love trying new things and expanding our passion for incredible food! Five: What will staff wear? This may seem like a silly questions. But, we know we’ve got you thinking about it now. You will want to make sure that the service staff blends nicely with the type of wedding you are planning and fade into the background as necessary. You never know who your photographer may catch in their photos. For example, white-glove service at a rustic outdoor wedding is going to feel a little disjointed. Our sharp-dressed team gets into the festive wedding spirit. Keep in mind these questions when deciding on a caterer. While there isn’t necessarily a right or wrong answer, you need to make sure that you are in agreement with the answers you are given. It is important for you to gel with your vendor – we can’t stress that enough! Give us a call today to learn more about our catering service, event rentals and more. We know that the details matter and we’ll assist you with as many details as you would like!